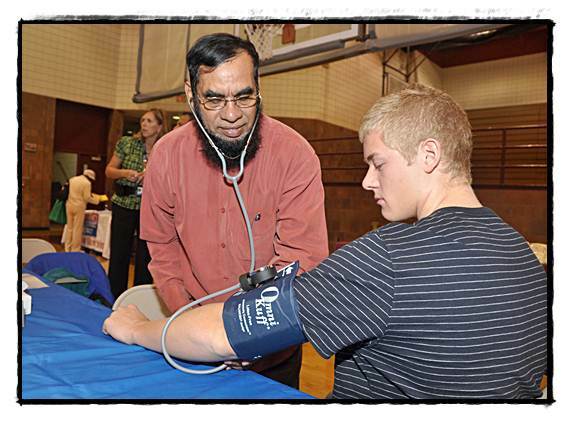 This Saturday (June 9), head on over to the Henry Ford Health Center for a free health fair. There will be a number of activities for adults and kids, as well as free refreshments. Presentations will be made on a variety of health issues. Henry Ford’s medical center started out with the idea of throwing an open house to introduce a new doctor to the community. And so, this Saturday (June 9), the public is welcomed to attend an open house and a health fair. For kids, there will be inflatable toys to bounce around on as well as games and activities. For adults, it’s a chance to hear talks about health tips from the center’s physicians on a variety of subjects, including hypertension, contraception and diabetes. And since Hamtramck is a multi-ethnic community, there will also be health topics discussed in the Arabic language. Beach said this will also be a chance to talk about candid health issues, you know, those topics you’ve been too embarrassed to ask your family or friends. “We can tell you whether you need to make an appointment, or not to worry about it,” she said. Also at the health fair will be the center’s physical therapy department, which will talk to you about any aches or pains you might be experiencing, including arthritis issues. There will also be free hotdogs, refreshments and raffle and prizes. Sounds like an inexpensive way to spend quality time with the family this weekend. Henry Ford Medical Center is located at 9100 Brombach (just south of Holbrook). For more information, call (313) 972-9000. The health fair runs from 10 a.m. to 1 p.m.